William Thompson was born Unknown, and died Unknown. He is the son of Unknown Thompson. Alice Searle was born July 31, 1833, in Hope Twp., Durham Co., Upper Canada, and died December 9, 1893, in Novesta Twp., Tuscola Co., MI, at age 60 years, 4 months and 9 days. Buried in Novesta Township Cemetery, Cass City, Tuscola Co., MI. She is the daughter of William Husband Searle of Tywardreath, County Cornwall, England, and Anne Hill of England. Unknown Thompson and Alice Searle were married about 1849 in Canada. George William Thompson: Born 1849 in Hope Twp., Durham Co., Canada West; Died after 1860, possibly in Wisconsin. Phoebe Jane Thompson: Born November 10, 1854, in Hope Twp., Durham Co., Canada West; Died April 18, 1936, at Eloise Infirmary, Nankin Twp., Wayne Co., MI (age 81). Buried in Eloise Cemetery, Eloise, Wayne Co., MI. Married (1) October 14, 1874, in Blenheim, Kent Co., Ontario, Canada, to Peter Hall: Born November 10, 1847, in Howard Twp., Kent Co., Canada West; Died December 12, 1904, in Harwich Twp., Kent Co., Ontario, Canada (age 56). Buried in Morpeth Cemetery, Morpeth, Chatham-Kent Municipality, Ontario, Canada. He committed Suicide. Phoebe came to Michigan about 1906. Married (2) May 19, 1906, in Essex Center, Essex Co., Ontario, Canada, to Marion Deroy Weekley: Born July, 1862, in Tyler Co., VA; Died after 1915 in Eloise, Wayne Co., MI. Buried in Eloise Cemetery, Eloise, Wayne Co., MI. 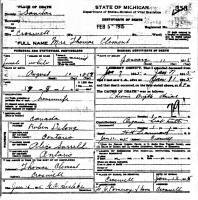 Divorced April 30, 1914, in Muskegon, Washtenaw Co., MI. Married (3) September 19, 1914, in Detroit, Wayne Co., MI, to William Terry Voorheis Jr.: Born May, 1862, in Michigan; Died November 3, 1934, at William Seymour Hospital, Nankin Twp., Wayne Co., MI (age 72). Buried in Eloise Cemetery, Eloise, Wayne Co., MI. William was a real estate agent in Detroit, MI. His mother, Anna Riekor/Riker, was born February, 1835, in Michigan. Alice (Searle) Thompson then married Reuben L. DeLong. Reuben L. DeLong was born February 15, 1829, in Cavan Twp., Victoria Co., Upper Canada, and died December 10, 1903, in the Village of Cass City, Tuscola Co., MI, at age 74. Buried in Novesta Township Cemetery, Cass City, Tuscola Co., MI. He is the son of Reuben DeLong of Columbia Co., NY, and Sybil Decker of West Copake, NY. Reuben L. DeLong (age 28) and Alice (Searle) Thompson (age 23) were married February 3, 1858, in Northumberland and Durham Co., Canada West. Anna Sybil DeLong: Born August 10, 1857, in Hope Twp., Durham Co., Canada West; Died January 11, 1915, in Croswell, Sanilac Co., MI (age 57). Buried in Croswell Cemetery, Croswell, Sanilac Co., MI. Married March 25, 1879, in London, Ontario, Canada, to Thomas Josiah Clement: Born March, 1853, in English Canada; Died May 3, 1931, in Port Huron, Saint Clair Co., MI (about age 78). Buried in Croswell Cemetery, Croswell, Sanilac Co., MI. Orren Island Harry "Orra" DeLong: Born November 29, 1858, in Port Hope, Hope Twp., Durham Co., Canada West; Died December 17, 1924, in Novesta Twp., Tuscola Co., MI (age 66). Buried in Novesta Township Cemetery, Cass City, Tuscola Co., MI. Married December 22, 1881, in Kent Co., Ontario, Canada, to Mary Ann Comfort: Born November, 1859, in Chatham, Kent Co., Canada West; Died August 25, 1946, in Cass City, Tuscola Co., MI (age 86). Buried in Novesta Township Cemetery, Cass City, Tuscola Co., MI. Levi Edward DeLong: Born September 19, 1860, in Newcastle, Durham Co., Canada West; Died February 25, 1933, in Novesta Twp., Tuscola Co., MI (age 72). Buried in Elkland Township Cemetery, Cass City, Tuscola Co., MI. Married (1) May 1, 1883, in Ridgetown, Ontario, Canada, to Elizabeth "Lizzie" McKay: Born May 8, 1864, in Harwich Twp., Kent Co., Canada West; Died April 6, 1928, in Novesta Twp., Tuscola Co., MI (age 63). Buried in Elkland Township Cemetery, Cass City, Tuscola Co., MI. Married (2) March 8, 1930, in Ridgetown, Ontario, Canada, to Mary E. (Guyett) Goff: Born June 19, 1873, in Clarke Twp., Durham Co., Ontario, Canada; Died 1947 in Unknown (about age 74). Daniel Maynard DeLong: Born November, 1862, in Hope Twp., Durham Co., Canada West; Died August 30, 1930, in Everett, Snohomish Co., WA (about age 66). 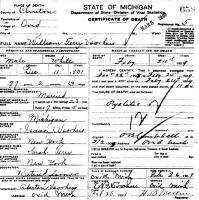 Married November 14, 1900, at the home of J. F. Webster, 908 Fraser Street, Bay City, Tuscola Co., MI, to Maud Nellie Houghton: Born January 29, 1875, in Ekland Twp., Tuscola Co., MI; Died May 27, 1924, in Everett, Snohomish Co., WA (age 49). John Henry DeLong: Born January 27, 1865, in Port Hope, Hope Twp., Durham Co., Canada West; Died August 19, 1943, at the home of his daughter, Port Huron, St. Clair, St. Clair Co., MI (age 78). Buried in Lakeside Cemetery, Port Huron, St. Clair Co., MI. 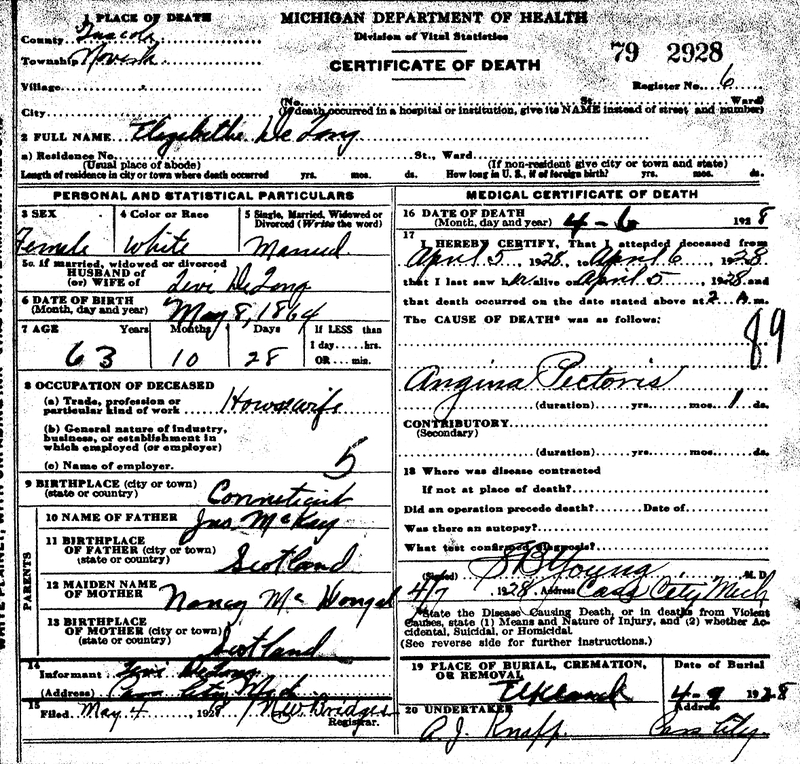 Married (1) December 11, 1889, in Ridgetown, Ontario, Canada, to Mary Ann Wright: Born September 29, 1870, in Harwich, Kent Co., Ontario, Canada; Died November 15, 1898, in Novesta Twp., Tuscola Co., MI (age 28). Buried in Novesta Township Cemetery, Cass City, Tuscola Co., MI. Married (2) December 20, 1900, in North Branch, Tuscola Co., MI, to Margurite Bell "Maggie" Justin: Born April 24, 1879, in St. Clair Twp., St. Clair Co., MI; Died December 15, 1955, at Providence Hospital, Detroit, Wayne Co., MI (age 76). Buried in Lakeside Cemetery, Port Huron, St. Clair Co., MI. Separated about 1929 in Michigan. Rosanna Matilda "Rose" DeLong: Born November 18, 1866, in Hope Twp., Durham Co., Canada West; Died November 29, 1936, in Fort Frances, Rainy River Dist., Ontario, Canada (age 70). Married January 28, 1890, in Ridgetown, Kent Co., Ontario, Canada, to Oliver Lester Warner: Born July 11, 1862, in Hope Twp., Durham Co., Canada West; Died after 1945 in Canada. Charlotte M. DeLong: Born 1868 in Hope Twp., Durham Co., Canada West; Died before 1881 in Ontario, Canada (about age 13). William Reuben DeLong: Born February 17, 1870, in Durham Co., Ontario, Canada; Died July 24, 1925, in Flint, Genesee Co., MI (age 55). Buried in Novesta Township Cemetery, Cass City, Novesta Twp., Tuscola Co., MI. Married October 31, 1894, in Cass City, Tuscola Co., MI, to Margaret J. "Maggie" McLean: Born January 27, 1874, in Rodney, Ontario, Canada; Died November 9, 1960, in Traverse City, MI (age 86). Buried in Novesta Township Cemetery, Cass City, Tuscola Co., MI. Sarah Melissa DeLong: Born April 12, 1872, in Durham Co., Ontario, Canada; Died January 9, 1942, in Port Huron, St. Clair Co., MI (age 69). Buried in Lakeside Cemetery, Port Huron, St. Clair Co., MI. 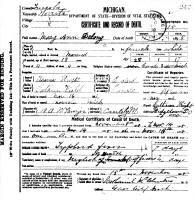 Married (1) November 14, 1888, in Blenheim, Kent Co., Ontario, Canada, to John Edward Connellan: Born November 16, 1867, in London, England; Died April 30, 1934, in Port Huron, St. Clair Co., MI (age 66). Buried in Lakeside Cemetery, Port Huron, St. Clair Co., MI. Divorced about 1910 - 1912. 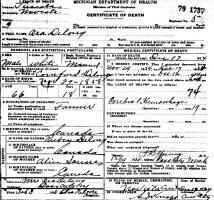 Married (2) in Michigan, to Unknown Bailey: Born Unknown; Died Unknown. 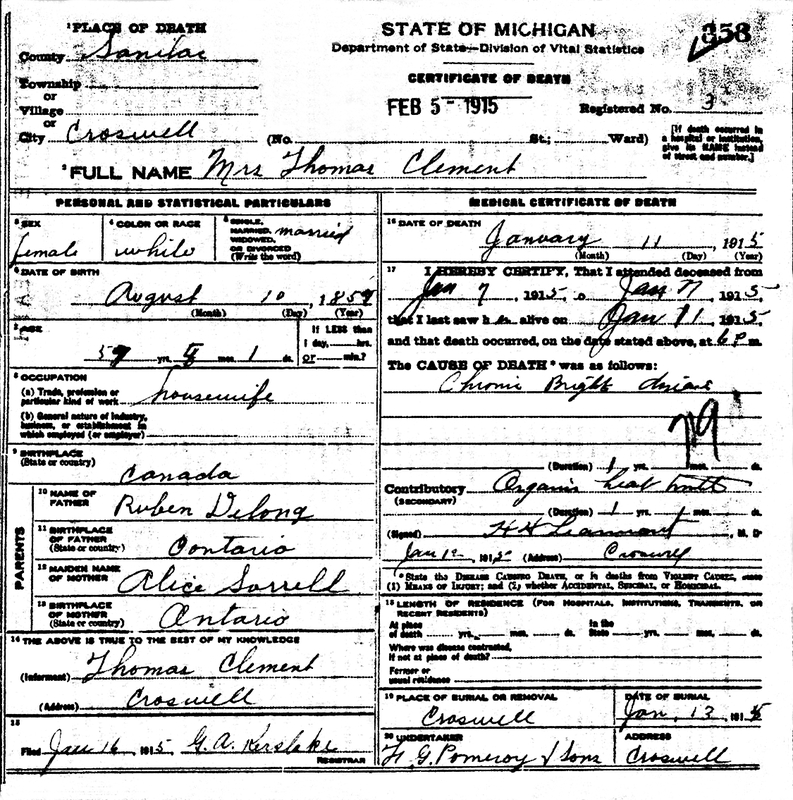 Married (3) July 6, 1920, in Birmingham, Oakland Co., MI, to Lloyd D. Townsend: Born September 2, 1869, in Caro, Tuscola Co., MI; Died May 4, 1946, in Fawn River, St. Joseph Co., MI (age 76). Buried in Oak Hill Cemetery, Pontiac, Oakland Co., MI. Divorced before 1926 in Michigan. 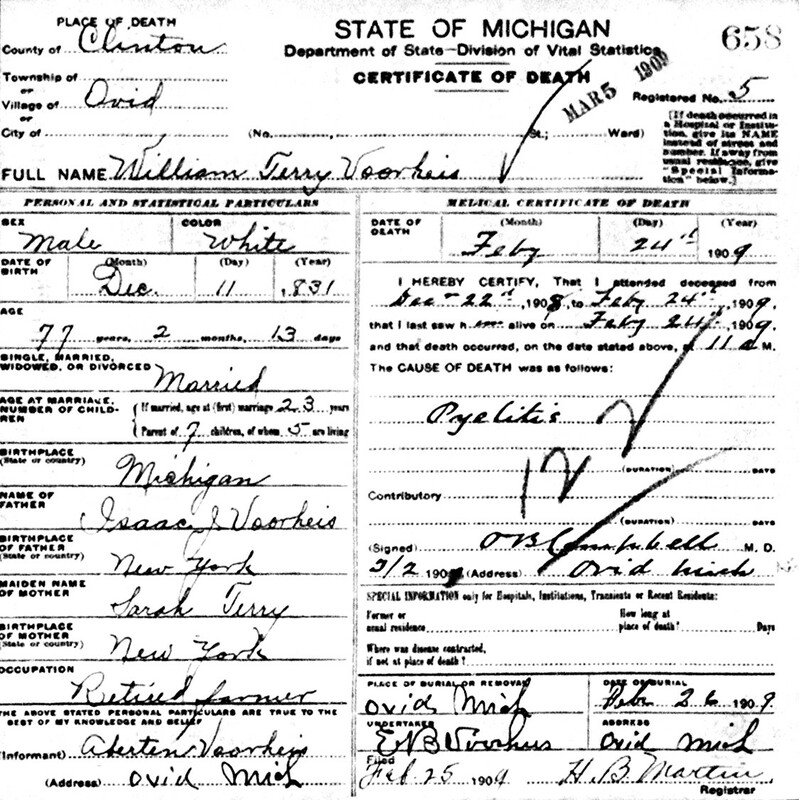 Married (4) November 25, 1926, in Detroit, Wayne Co., MI, to Martin A. Vanderhoof: Born June 30, 1871, in Allendale, Ottawa Co., MI; Died May 30, 1951, in Port Huron, St. Clair Co., MI (age 79). Buried in Lakeside Cemetery, Port Huron, St. Clair Co., MI. John then married January 4, 1912, in Port Huron, St. Clair Co., MI, to Isabella Mae "Bella" (McLaughlin) (Unknown) Hoffman: Born December 10, 1866, in Lambton Co., Ontario, Canada West; Died January 13, 1940, in Port Huron, St. Clair Co., MI (age 73). Buried in Lakeside Cemetery, Port Huron, St. Clair Co., MI. 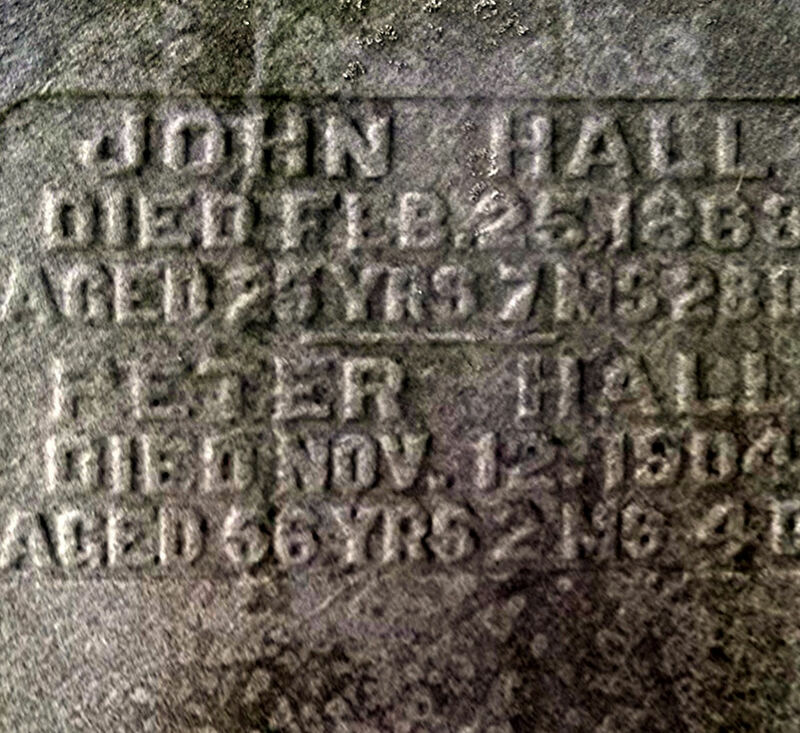 Peter Hall is buried in Morpeth Cemetery, Morpeth, Chatham-Kent Municipality, Ontario, Canada. William Thompson was born Unknown. Reuben L. DeLong was born February 15, 1829, in Cavan Twp., Durham Co., Upper Canada. Alice Searle was born July 30, 1833, in Durham Co., Upper Canada. Peter Hall and Phoebe Jane Thompson were married October 10, 1874, in Blenheim, Kent Co., Ontario, Canada. 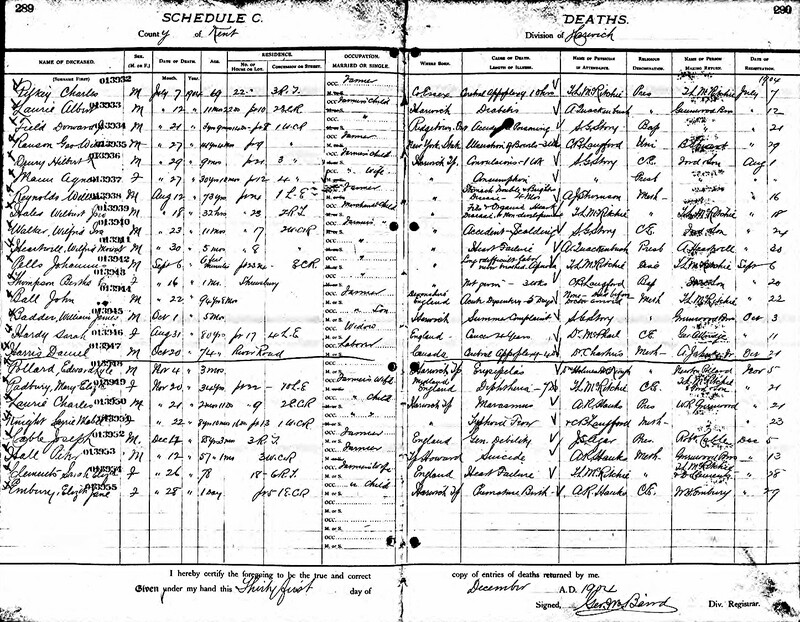 Peter Hall and Phoebe Jane (Searle) Thompson were married October 10, 1874, in Blenheim, Kent Co., Ontario, Canada. The 1851 Census/Assessment for Hope Township, Canada West, shows Charles Abbey living on Lot 27, Concession 3, Total of 4 in Family. The Charles Abbey family lives in a Shanty, which includes both Allice Sarl (age 17) unmarried, and George Sarl (age 1). Leigh Larson note: Allice is likely Alice (Searle) Thompson, the widowed sister of Elizabeth (Searle) Abbey. George Sarl is likely George William Thompson, Alice's son. 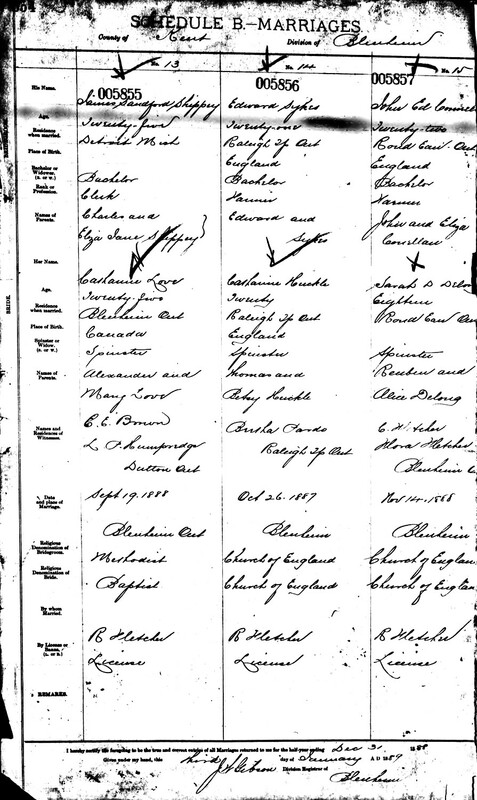 1851 Canadian Census shows Charles Abbey (age 27) born in Canada and with W. Methodist religion is a married Laborer and is living in a Shanty in Hope Twp., Durham Co., Canada West. Living with him are: a married female, Elizabeth Abbey (age 26) born in England and W. Methodist religion; Metilda L. Abbey (age 4); and Isaac Abbey (age 2) born in Canada. Also living there, but not residents, are: and unmarried female, Allice Sarl (age 17) born in Canada and W. Methodist religion; and George Sarl (age 1) born in Canada. Leigh Larson note: The Charles Abbey family includes Elizabeth (Searle) Abbey, the sister of Mary (Searle) Watson, Allice Sarl (age 17) unmarried, and George Sarl (age 1). Allice Searle is likely Alice (Searle) Thompson, the widowed daughter of William Husband Searle, and George Searle is George William (Searle) Thompson (born 1849 in Hope Twp., Durham Co., Canada West), the son of the widowed Alice (Searle) Thompson. 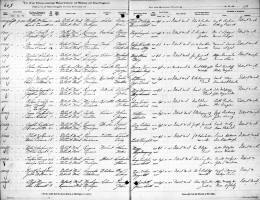 1851 Canadian Census shows William Watson (age 26) born in Canada and with Catholic religion is a Labourer and is living in a Frame Home in Hope Twp., Durham Co., Canada West. Living with him is Mary Watson (age 26) born in England and affiliated with the Church of England religion. Also living there are three Watson children, all born in Canada: Franklin Watson (age 4); Laury Ann Watson (age 3); and Hannah Watson (age 1). Leigh Larson note: The Charles Abbey family lives in a Shanty a few homes away, including Elizabeth (Searle) Abbey, the sister of Mary (Searle) Watson, Allice Sarl (age 17) unmarried, and George Sarl (age 1). Allice Searle is likely Alice (Searle) Thompson, the widowed daughter of William Husband Searle, and George Searle is George William (Searle) Thompson (born 1849 in Hope Twp., Durham Co., Canada West), the son of the widow, Alice (Searle) Thompson. 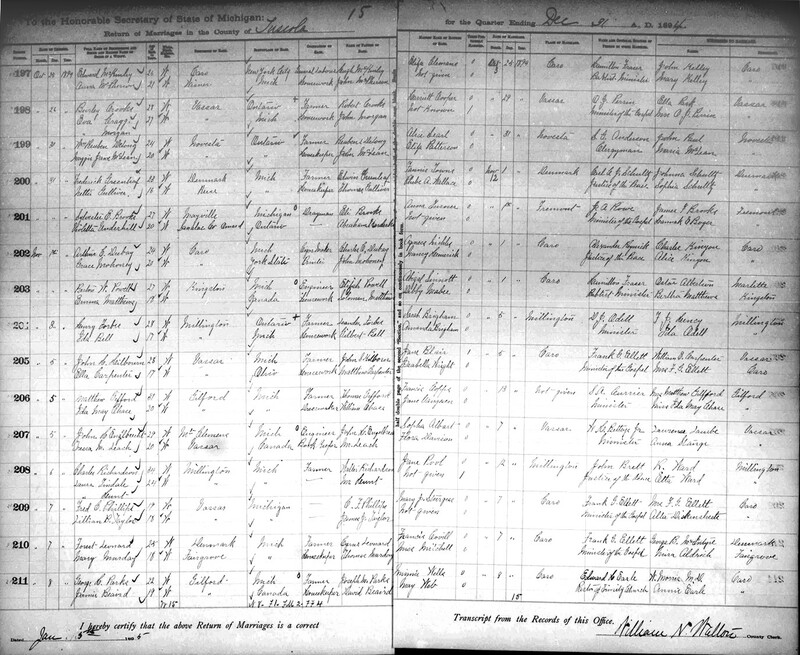 The 1860 U. S. Census taken on July 5, 1860, shows William Surl (age 60) born in England with real estate valued at $800 and personal estate valued at $400 and who cannot read and write is a married Farmer, and is living in Oak Grove Twp., Dodge Co., WI. Living with him is his wife, Abigal Surl (age 69) born in Connecticut who cannot read and write. Also living there are: Thomas Surl (age 25) born in New York who cannot read and write and indicated as insane; and William Surl, Jr. (age 11) born in Canada. 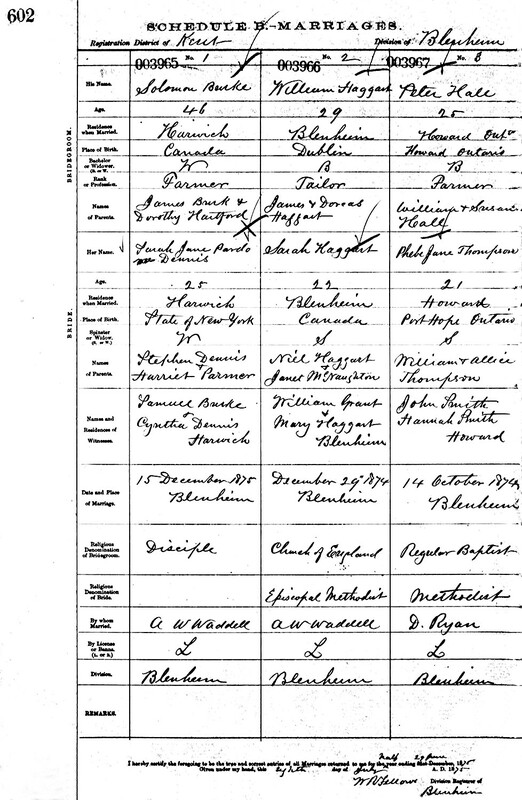 This might be the "George Searle" (George William Thompson) mentioned in the 1851 Canadian census. Leigh Larson Note: This is likely George William (Searle) Thompson (born 1849 in Hope Twp., Durham Co., Canada West), the son of the widow, Alice (Searle) Thompson. 1861 Canadian Census shows Rueben Delong (age 31) born in Canada and with Church of England religion is a married Farmer living in a Frame House, and is living in Hope Twp., Durham Co., Canada West. Living with him are: a married female, Allice Delong (age 27) born in Canada and with Church of England religion; a single female, Phebe Jean Delong (age 7) born in Canada and with Church of England religion; a single female, Ann Delong (age 4) born in Canada and with Church of England religion; a single male, Arrey Delong (age 2) born in Canada and with Church of England religion; a single male, Levi Delong (age 1) born 1860 in Canada and with Church of England religion; and a widowed female, Sibyl Delong (age 71) born in the United States and with Pres. and Dutch Reformed religion. 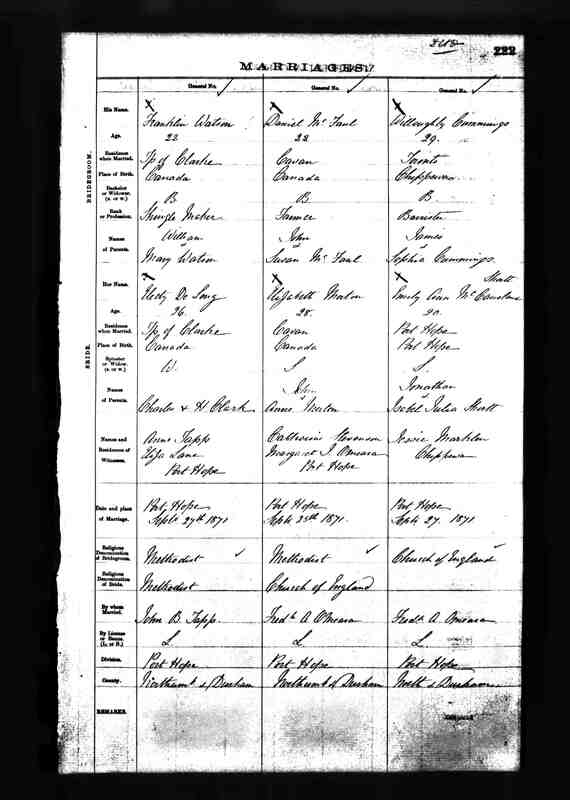 1861 Canadian Census shows William Watson (age 37) born in Ontario and with W. M. religion is a Farmer and is living in a Shanty and is living in Clarke Twp., Durham Co., Canada West. Living with him is Mary Watson (age 38) born in England and with W. Methodist religion. Also living there are five Watsons, all born in Ontario: Franklin Watson (age 13), a Labourer; Hanah Watson (age 6); Ann Watson (age 6); William Watson (age 4); and Eliza Watson (age 1, birth in 1860). Electa Clarke born about 1844 in Clarke Twp., daughter of Charles and Harriett Clarke, was first married on May 23, 1860, to Reuben Delong, born about 1838 in Rochester Twp., or Rochester, NY, the son of James Delong and Lorinda Clarke. Franklin Watson (age 22), a Shingle Maker, married a widow, Electa (Clarke) Delong (age 26) in Durham Co. in 1871. There was one son, Albert Delong, born March 24, 1865 in Ontario. 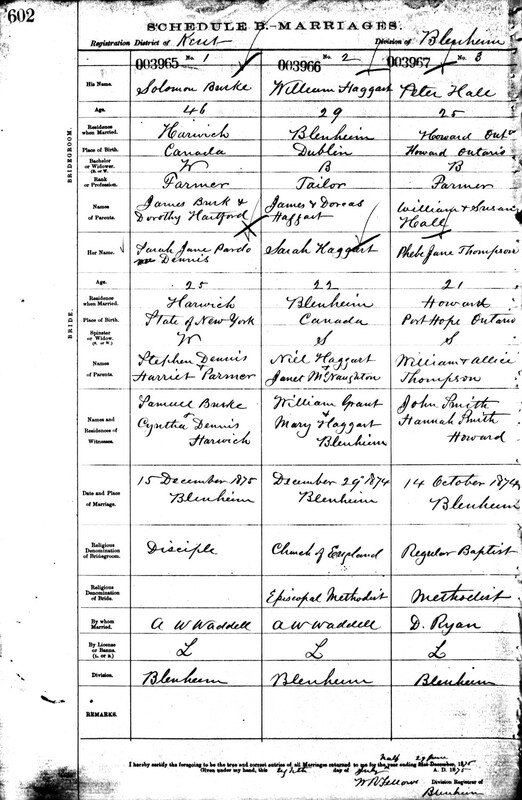 The 1871 Canadian Census shows William Watson (age 46) born in Ontario and with Universalist religion is a Farmer and is living in Harwich Twp., Kent Co., Canada West. Living with him is Mary Watson (age 47) born in England and with W. Methodist religion. Also living there are five Watsons, all born in Ontario: Franklin Watson (age 23), a Laborer; Hannah Watson (age 17); Emily Watson (age 15); William G. Watson (age 13); and Eliza J. Watson (age 10). The 1871 Canadian Census shows Reuben Delong (age 41) born in Ontario, Canada, and with Wesley Methodist religion, is a married Farmer living in Hope Twp., East Durham Dist., Ontario, Canada. Living with him are: a married female, Allis Delong (age 37) born in Ontario, Canada, and with Wesley Methodist religion, who is unable to write; a single female, Phebe Jane Delong (age 17) born in Ontario, Canada, and with Wesley Methodist religion, a Farmer; a single female, Sylabel Delong (age 14) born in born in Ontario, Canada, and with Wesley Methodist religion; a single male, Orra Island Delong (age 12) born in Ontario, Canada, and with Wesley Methodist religion; a single male, Levi Edward Delong (age 11) born in Ontario, Canada, and with Wesley Methodist religion; a single male, Daniel M. Delong (age 10) born in Ontario, Canada, and with Wesley Methodist religion; a single male, John Henry Delong (age 8) born in Ontario, Canada, and with Wesley Methodist religion; a single female, Rossanna M. Delong (age 5) born in Ontario, Canada, and with Wesley Methodist religion; a single female, Sharlot M. Delong (age 3) born in Ontario, Canada, and with Wesley Methodist religion; and a single male, William R. Delong (age 1) born in Ontario, Canada, and with Wesley Methodist religion. 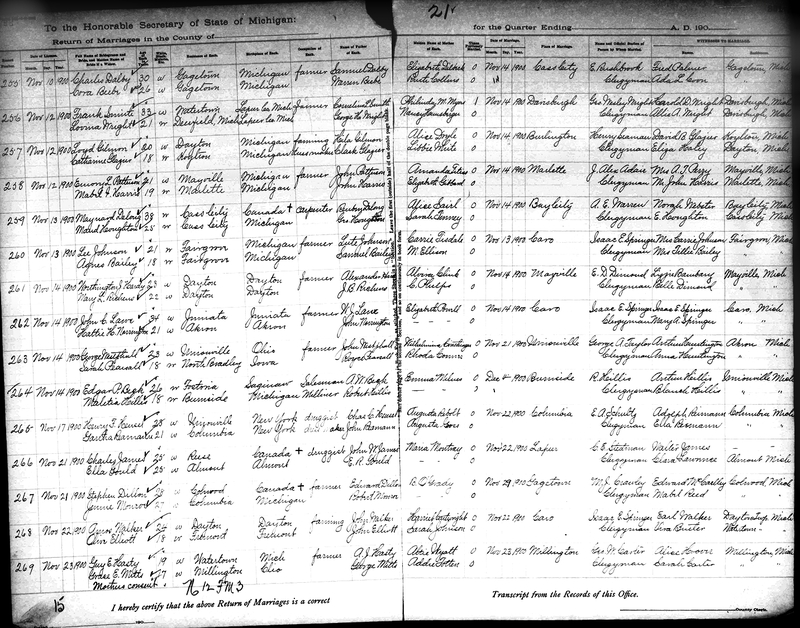 Peter Hall and Phoebe Jane Thompson Marriage Record. The 1881 Canadian Census shows Ruben Delong (age 51) born in Ontario, Canada, and with Methodist Episcopal religion, is a married Farmer living in Howard Twp., Bothwell Co., Ontario, Canada. Living with him are: a married female, Allis Delong (age 47) born in Ontario, Canada, and with Methodist Episcopal religion; a single male, Minerd Delong (age 18) born in Ontario, Canada, and with Methodist Episcopal religion; a single male, Orrie Delong (age 22) born in born in Ontario, Canada, and with Methodist Episcopal religion; a single male, John Delong (age 17) born in Ontario, Canada, and with Methodist Episcopal religion; a single female, Anna Delong (age 15) born in Ontario, Canada, and with Methodist Episcopal religion; a single male, Ruben Delong (age 11) born in Ontario, Canada, and with Methodist Episcopal religion; and a single female, Sarah Delong (age 9) born in Ontario, Canada, and with Methodist Episcopal religion. 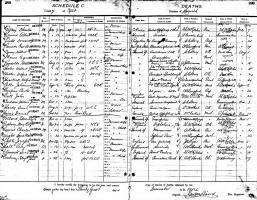 John Edward Connellan and Sarah Melissa DeLong were married November 14, 1888, in Blenheim, Kent Co., Ontario, Canada. 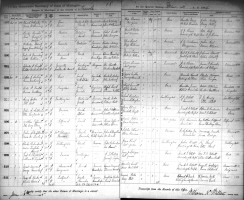 John Edward Connellan and Sarah Melissa DeLong Marriage Record. Alice (Searle) (Thompson) DeLong died December 9, 1893, in Novesta Twp., Tuscola Co., MI, at age 60 years, 4 months and 9 days. DELONG. - In Novesta, on Friday, Dec. 8, 1893, Mrs. Reuben Delong, Sr., aged 60 years. Death has again been in our midst and claimed for its victim Mrs. Reuben Delong, Sr. She had been ailing for some time but was not thought dangerous until Friday afternoon, when she grew worse and died during the night. Deceased was in her sixtieth birthday and leaves a husband and several children to mourn her loss. The funeral was held Tuesday, at 10 o'clock, and was attended by a large number of friends. Rev. Gilchriese, of Cass City, officiated. William Reuben DeLong and Margaret J. "Maggie" McLean were married October 31, 1894, in Cass City, MI. William Reuben DeLong and Margaret J. 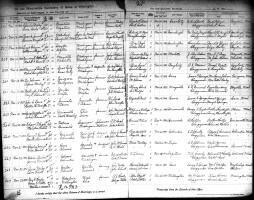 "Maggie" McLean Marriage Record. Mary Ann (Wright) DeLong died November 15, 1898, in Novesta Twp., Tuscola Co., MI, at age 28. Buried in Novesta Township Cemetery, Cass City, Tuscola Co., MI. 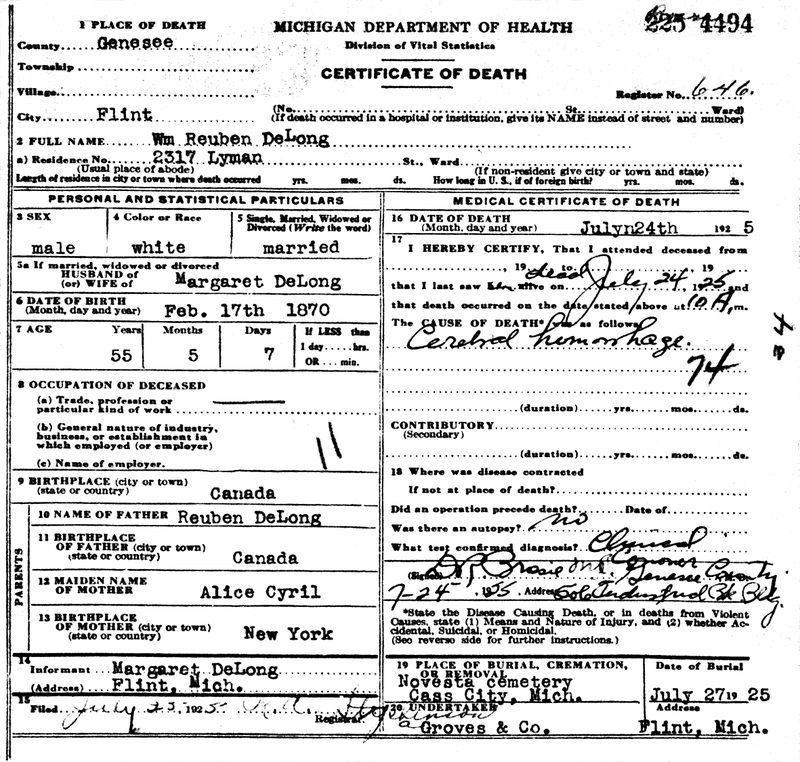 Mary Ann (Wright) DeLong Death Certificate. 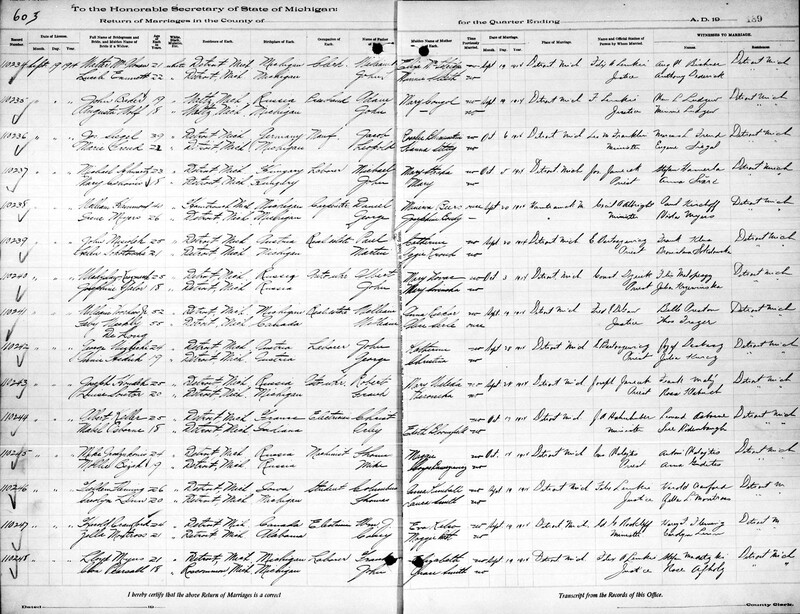 The 1900 U. S. Census taken on June 7, 1900, shows Reuben Delong (age 30) born February, 1870, in English Canada to English Canadian-born parents, and having immigrated in 1881 and with Al Citizenship, is a married Farmer who owns his farm with a mortgage, and is living in Novesta Twp., Tuscola Co., MI. Living with him is his childless wife of 5 years, Maggie Delong (age 26) born January, 1874, in English Canada to English Canadian-born parents, and having immigrated in 1892. 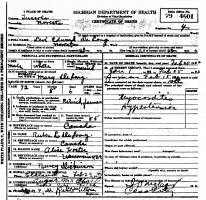 Also living there are: his widowed father, Reuben L. Delong (age 70) born January, 1830, in English Canada to Pennsylvania and New York-born parents, and having immigrated in 1891 and with Al Citizenship; and his nephew, Roy Delong (age 6) born April, 1894, in Michigan to English Canadian-born parents. Daniel Maynard DeLong and Maud Nellie Houghton were married November 14, 1900, at the home of J. F. Webster, 908 Fraser Street, Bay City, Tuscola Co., MI. Daniel Maynard DeLong and Maud Nellie Houghton Marriage Record. Reuben L. DeLong died December 10, 1903, in the Village of Cass City, Tuscola Co., MI, at age 74. 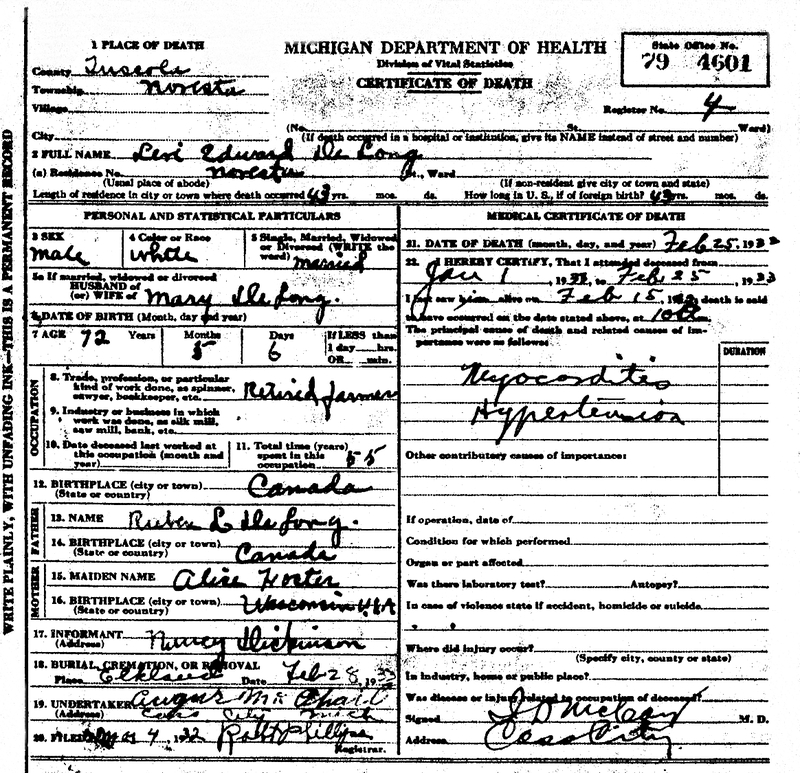 Reuben L. DeLong Death Certificate. Reuben Delong, an old and respected citizen, passed away yesterday at the home of his son, Maynard, who lives on south Seegar street. Mr. Delong was born in Canada, Jan. 15, 1828, where he was raised and resided until about fourteen years ago, when he came to these parts where he has since lived. About eight years ago his companion, with whom he raised a family of nine children, passed away. Since that time he has made his home with his children. While yet in Canada he became a member of the M. E. church and since then lived a christian life. The funeral will be held next Sunday from the local M. E. church, Rev. Dr. Gifford officiating. His children, most of whom are well known here, are as follows: James, Orrie, Levi, Maynard, John and Reuben Delong, Mrs. Thos. Clements, Mrs. John Cornellon of Port Huron and Mrs. Lester Warner of northwest Canada. 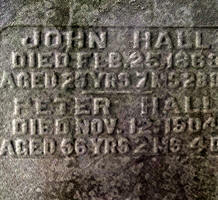 Peter Hall died December 12, 1904, in Harwich Twp., Kent Co., Ontario, Canada, at age 56. Buried in Morpeth Cemetery, Morpeth, Chatham-Kent Municipality, Ontario, Canada. He committed Suicide. William Terry Voorhies Sr. died February 24, 1909, in the Village of Ovid, Clinton Co., MI. Buried in Ovid Cemetery, Ovid, Clinton Co., MI. William Terry Voorhies Sr. Death Certificate. William Terry Voorhies Jr. and Phoebe Jane (Thompson) (Hall) Weekly were married September 19, 1914, in Detroit, Wayne Co., MI. 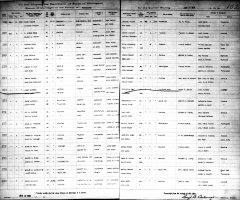 William Terry Voorhies Jr. and Phoebe Jane (Thompson) (Hall) Weekly Marriage Record. Anna Sybil (DeLong) Clement died January 11, 1915, in Croswell, Sanilac Co., MI, at age 57. Buried in Croswell Cemetery, Croswell, Sanilac Co., MI. 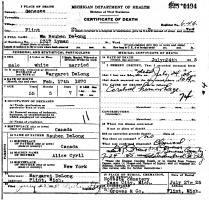 Anna Sybil (DeLong) Clement Death Certificate. Lloyd D. Townsend and Sarah Melissa (DeLong) (Connellan) (Bailey) Townsend were married July 6, 1920, in Birmingham, Oakland Co., MI. Lloyd D. Townsend and Sarah Melissa (DeLong) (Connellan) Bailey Marriage Record. Orren Island Harry "Orra" DeLong died December 17, 1924, in Novesta Twp., Tuscola Co., MI, at age 66. Buried in Novesta Township Cemetery, Cass City, Tuscola Co., MI. 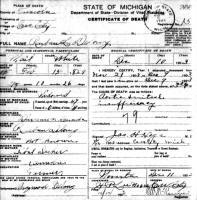 Orren Island Harry "Orra" DeLong Death Certificate. Orra Delong was born in the Township of Hope, Durham county, Ontario, on Nov. 29, 1858. He moved to Sanilac county, Michigan, in 1890. On January 1, 1899, he came to Tuscola county and since that time has lived in Novesta township. He married Mary Comfort of Kent county, Ont., on Dec. 22, 1881. Six children were born to them. One died in infancy, and a daughter, Rosa, passed away in 1909. Four children survive, Mrs. John Walmsley of Cass City, James Delong and Mrs. Harvey Mills of Pontiac and Maynard Delong of Novesta. He also leaves four brothers and three sisters, Levi Delong of Cass City, Maynard Delong of Everett, Wash., John Delong of Port Huron, Reuben Delong of Flint, Jane Voorheis of Detroit, Rose Warner of Fort Frances, Ont., and Sarah Townsend of Detroit, besides 14 grandchildren and two great grandchildren. Mr. Delong was a member of the Church of Christ of Novesta. He passed away Dec. 17, 1924, at the age of 66 years and 18 days. Interment was made in Novesta cemetery. William Reuben DeLong died July 24, 1925, in Flint, Genesee Co., MI, at age 55. Buried in Novesta Township Cemetery, Cass City, Novesta Twp., Tuscola Co., MI. 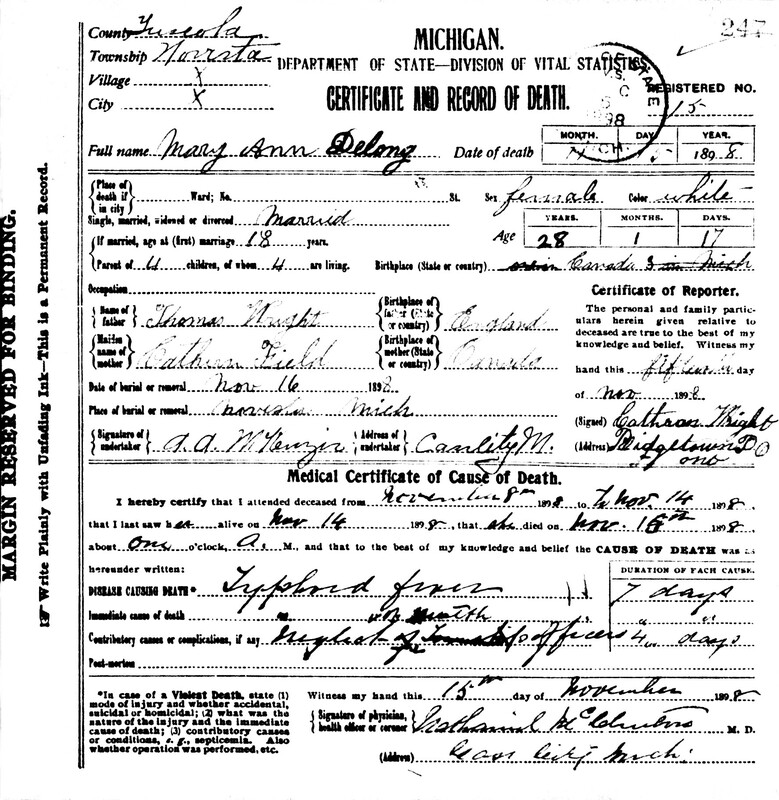 William Reuben DeLong Death Certificate. Reuben Delong, a resident of Novesta township for many years, died suddenly at his home in Flint Friday morning at the age of 55 years. Mr. Delong was taken ill during the Christmas holiday season and was sick for several months. He had apparently recovered his health and had started work for a Flint contractor on Friday for the first time since his long illness. He had been on the job but a very short time when he fell over dead. The body was born from Flint and funeral services were conducted by Colin Ferguson at the Church of Christ on Monday afternoon. Burial was made in Novesta cemetery. Mr. Delong is survived by his widow, one son and one daughter. The family moved from Cass City to Flint two years ago. Several from Deford attended the funeral service Monday. The sympathy of the community is extended to the bereaved family. Martin A. Vanderhoof and Sarah Melissa (DeLong) (Connellan) (Bailey) Townsend were married November 25, 1926, in Detroit, Wayne Co., MI. 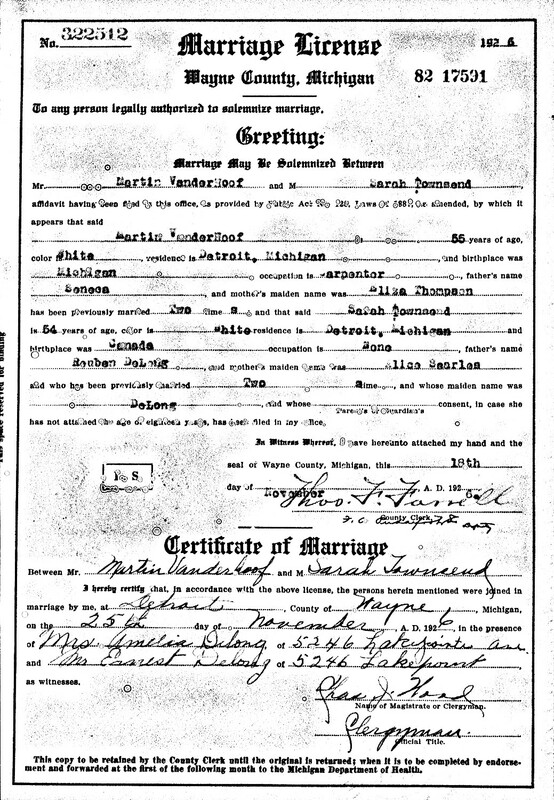 Martin A. Vanderhoof and Sarah Melissa (DeLong) (Connellan) (Bailey) Townsend Marriage Record. Elizabeth "Lizzie" (McKay) Delong died April 6, 1928, in Novesta Twp., Tuscola Co., MI, at age 63. Buried in Elkland Township Cemetery, Cass City, Tuscola Co., MI. 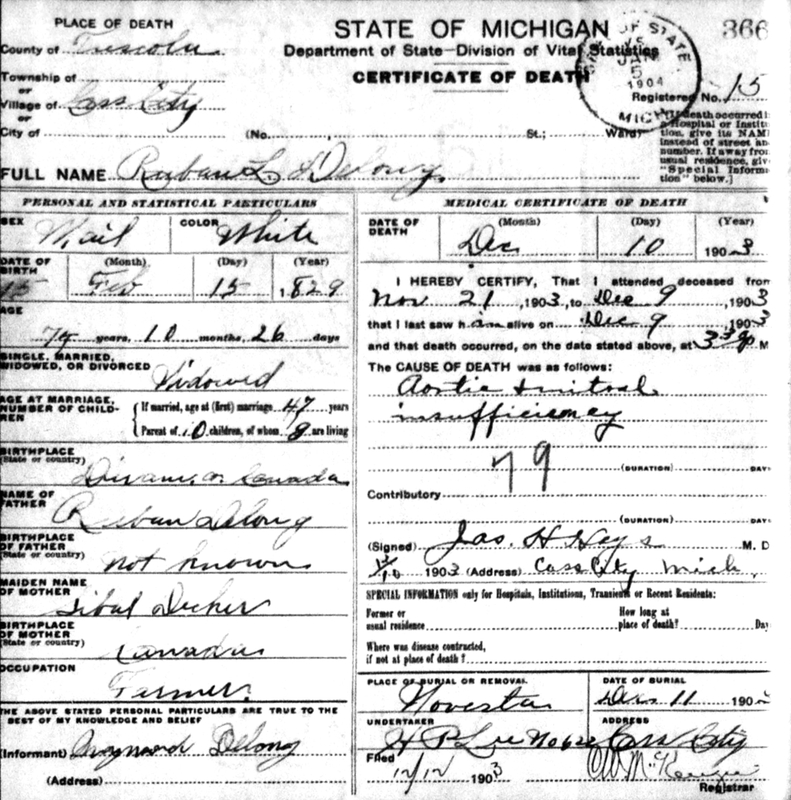 Elizabeth "Lizzie" (McKay) Delong Death Certificate. Mrs. Levi Delong passed away early Friday morning, April 6. Mrs. Delong had been in her usual health until Thursday when she complained of pains in her chest, but did her work throughout the day. Not feeling any better in the evening, a doctor was called, but he did not consider her condition serious. Soon after going to bed, she felt worse and passed away before the doctor arrived on the second call. Her untimely death proved to be a great shock to her many friends. Elizabeth McKay, daughter of Mr. and Mrs. John McKay, was born May 8, 1864, at Ridgetown, Ontario. She was united in marriage with Levi Delong May 1, 1883, at Ridgetown. Mr. and Mrs. Delong came to Cass City 39 years ago, buying the farm two miles south and one mile east of Cass City where they have since lived except nine years that they resided on South Seerger St., in Cass City. Besides her husband she leaves two sons and two daughters, John Delong of Deckerville, Mrs. John Dickinson of Bad Axe, Mrs. Ernest Reagh and Dan Delong, both of Cass City. One daughter, Julia Ellen, preceded the mother in death twenty years. She also leaves two brothers and one sister, Daniel McKay of Ridgetown, John McKay of Muirkirk, Ontario, and Mrs. Catherine Henderson of Thamesville, Ontario, and thirteen grandchildren and one great grandchild. She joined the Free Will Baptist church of Novesta 35 years ago and later joined the Baptist church at Cass City where she was always a willing and earnest worker in every branch of the church. She was an active member of Venus Rebekah Lodge and of the Past Noble Grands Club. All the children and the two brothers attended the funeral services which were held Monday afternoon at the Baptist church, Elder Mudge officiating. Burial was in Elkland cemetery. Those from out of town who attended the funeral were Mr. and Mrs. James Delong and children of Pontiac, Mr. and Mrs. Lawrence Clement and daughter of Croswell, Mr. and Mrs. Wm. G. Moore and daughter, Miss Mary, of Colling, Mr. and Mrs. Leo Heineman of Kingston and Alvin Cowan of Deckerville. 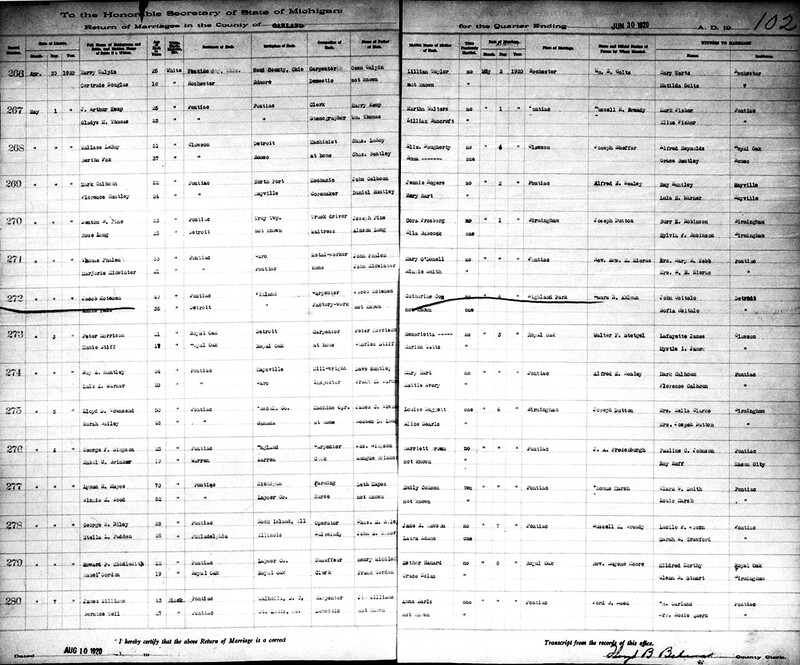 The 1930 U. S. Census taken on April 7, 1930, shows William T. Voorhies (age 67) born in Michigan to Michigan-born parents, and first married at age 52, is a married Head of Household, and who owns his home worth $17,300 and is living at 4865 South Martendale, 16th Ward, City of Detroit, Wayne Co., MI. Living with him is his wife, Phoebe J. Voorhies (age 69) born in English Canada to English Canadian-born parents, and having immigrated in 1905 and a Naturalized Citizen, and first married at age 54. Daniel Maynard Delong died August 30, 1930, in Everett, Snohomish Co., WA, at about age 66. Word was received Sunday that Maynard DeLong, a former resident of Cass City, had passed away that morning at the home of his brother-in-law, Chas. Houghton, in Everett, Wash.
Mr. DeLong was born in Canada and came here when a young man, living at Cass City until about 19 years ago when he moved to Everett. Mrs. DeLong (Maude Houghton) died six years ago. Mr. DeLong is survived by one son, Nigel Delong, of Everett, Wash., one grandson, two brothers, Levi Delong of Cass City and John DeLong of Pt. Huron, and three sisters, two in Detroit and one in Fort Francis, Ont. Funeral services and burial was at Everett. Levi Edward DeLong died February 25, 1933, in Novesta Twp., Tuscola Co., MI, at age 72. Buried in Elkland Township Cemetery, Cass City, Tuscola Co., MI. 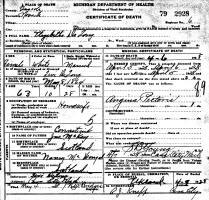 Levi Edward DeLong Death Certificate. Levi E. Delong, a resident of this community for 44 years, passed away at his home in Novesta township on Saturday, Feb. 25, at the age of 72 years. Funeral services were held at the Baptist church at Cass City on Tuesday afternoon, Rev. W. R. Curtis officiating, and interment was made at Elkland cemetery. Levi E. Delong was born in Dunham county, Ontario, Sept. 19, 1860. On May 1, 1883, he was united in marriage with Miss Elizabeth McKay and 44 years ago they moved to Novesta township, Tuscola county, where Mr. Delong followed the pursuit of farming for several years. Mrs. Delong passed away five years ago. Mr. Delong, on March 8, 1930, married Mrs. Mary Goff at Ridgetown, Ont., who survives him. He also leaves four children, John Delong, of Deckerville; Mrs. John Dickinson, of Bad Axe; Mrs. Ernest Reagh and Daniel Delong, both of Cass City; one brother, John Delong, of Port Huron; and three sisters, Mrs. Wm. Voorhes, of Detroit; Mrs. Edward Cornellan, of Port Huron; Mrs. Lester Warner, of Fort Francis, Ont. Mr. Delong has been an active member of the Baptist church at Cass City for many years and served as deacon in that society. He was highly respected and his best monument will be the good report that he has left behind in the community where he resided so many years. Friends and relatives from out-of-town who attended the funeral were Mr. and Mrs. Robert Schram, Mr. and Mrs. Jas. Delong and Mrs. Howard Willis, all of Pontiac, Mr. and Mrs. Edward Wright of Detroit, John Delong, Mr. and Mrs. Jas. Sophie, Mr. and Mrs. Ernest Clement and family, all of Port Huron, Mr. and Mrs. Lawrence Clement of Jeddo, Mr. and Mrs. F. A. Leverton, Ernest Guyette, Walter Guyette, Miss Adeline Guyette, Mr. and Mrs. Wm. Carnegie, and Mr. and Mrs. J. M. Scott, all of Highgate, Ont. 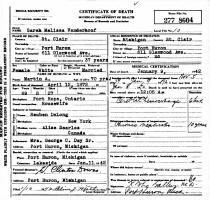 Sarah Melissa (DeLong) (Connellan) (Bailey) (Townsend) Vanderhoof died January 9, 1942, at her home, Port Huron, St. Clair Co., MI, at age 69. Buried in Lakeside Cemetery, Port Huron, St. Clair Co., MI. 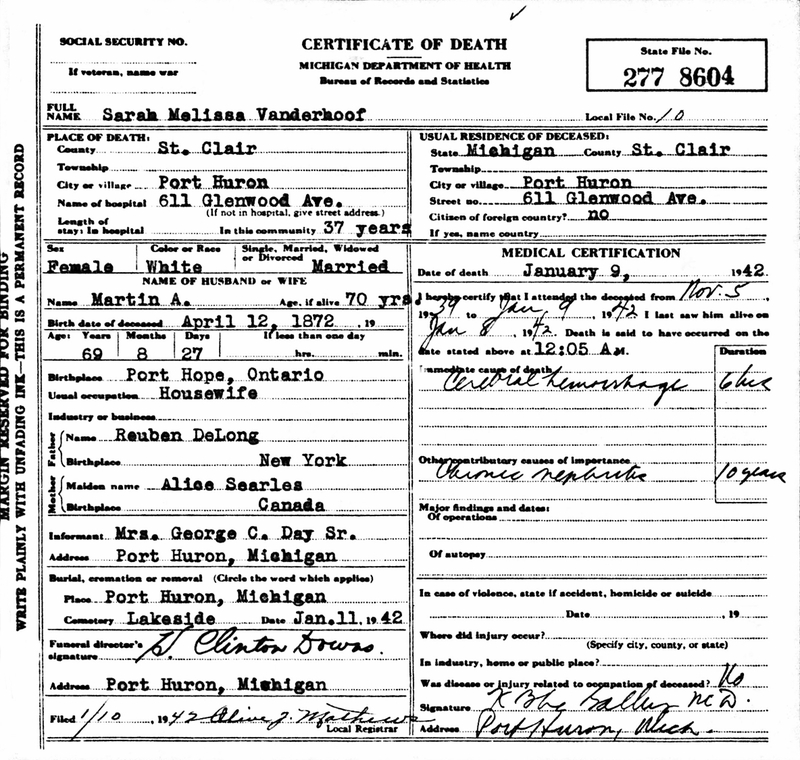 Sarah Melissa (DeLong) (Connellan) (Bailey) (Townsend) Vanderhoof Death Certificate. Mrs. Sarah M. Vanderhoof, 69, a resident of Port Huron for 37 years died today at her home, 611 Glenwood avenue, after a long illness. She is survived by her husband, Martin A. Vanderhoof, and a brother, John DeLong, both of Port Huron, three daughters, Mrs. Pearl Wagner and Mrs. Edith Callens, both of Detroit, and Mrs. George C. Day, Sr., Port Huron; two sons, Charles R. and Victor W. Connellan, both of Port Huron; a step-son, Ivan Vanderhoof, Chase, Mich., and a step-daughter, Mrs. Leola Maw, Corunna, Ont. Funeral services will be held in the Downs Funeral home at 2 p.m. Sunday. Rev. A. E. DuPlan, rector of Grace Episcopal church will officiate. Burial will be in Lakeside cemetery. 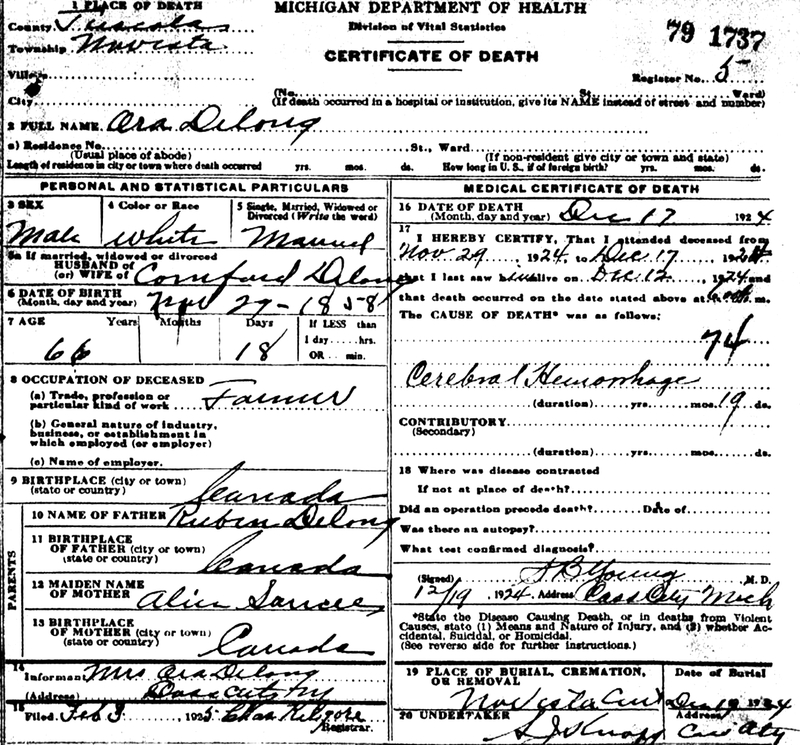 John Henry DeLong died August 19, 1943, at the home of his daughter, Port Huron, St. Clair, St. Clair Co., MI, at age 78. Buried in Lakeside Cemetery, Port Huron, St. Clair Co., MI. John Henry DeLong, 78, retired carpenter and resident of Port Huron 35 years, died Thursday night in the home of his daughter, Mrs. James H. Sopha, 1424 Fourteenth street, after a long illness. He was born Jan. 27, 1865, in Port Hope, Ont. He is survived by his widow, Margaret DeLong, Port Huron; a daughetr, Mrs. Sopha; three sons, Roy T. and John W. DeLong, both of Port Huron; and Nelson C. DeLong, Camp Wolters, Tex. ; 14 grandchildren and three great grandchildren. The remains are in the Arthur Smith funeral home where funeral services will be held at 1:30 p.m. Sunday. Rev. Clarence E. Vasbinder, pastor of Court Street Baptist church, will officiate. Burial will be in Lakeside cemetery. Margurite Bell "Maggie" (Justin) DeLong died December 15, 1955, at Providence Hospital, Detroit, Wayne Co., MI, at age 76. Buried in Lakeside Cemetery, Port Huron, St. Clair Co., MI. Mrs. Margaret B. DeLong, 76, Detroit, former Port Huron resident, widow of John H. DeLong, who died today at Providence Hospital, Detroit, after a long illness. Mrs. DeLong was born April 24, 1879, in St. Clair Township. She was a resident of Detroit 20 years. Mr. DeLong died Aug. 19, 1943. She is survived by a daughter, Mrs. James Sopha, Port Huron; three sons, John W. DeLong and Roy T. DeLong, both of Port Huron, and Nelson C. DeLong, Royal Oak; four sisters, Mrs. Dora Little and Mrs. Etta Burch, both of Detroit; Mrs. Cora Doubler, Port Huron, and Mrs. George Sands, Findlay, O.; a brother, John Justin, Detroit; and several nieces and nephews. The remains are in the Arthur Smith funeral home where funeral services will be held at 1:30 p.m. Saturday. Dr. John W. Greenwood, pastor of First Methodist church, will officiate. Burial will be in Lakeside cemetery. Funeral services for Mrs. Margaret B. DeLong, 76, Detroit, former Port Huron resident, widow of John H. DeLong, who died Thursday in Detroit, will be conducted at 1:30 p.m. Saturday in the Arthur Smith funeral home. Dr. John W. Greenwood, pastor of First Methodist church, will officiate. Burial will be in Lakeside cemetery. The remains are in the funeral home. In addition to the survivors listed Thursday, Mrs. DeLong is survived by a brother, William J. Justin, Port Huron. Leo J. Sopha, Donald Sopha, William D. DeLong, John DeLong, Robert DeLong and John Justin will be pallbearers.